Halfway through Forever Evil, Geoff Johns brings readers the origins of the rest of the Crime Syndicate beyond Owlman and Ultraman. The origin stories themselves are interesting. 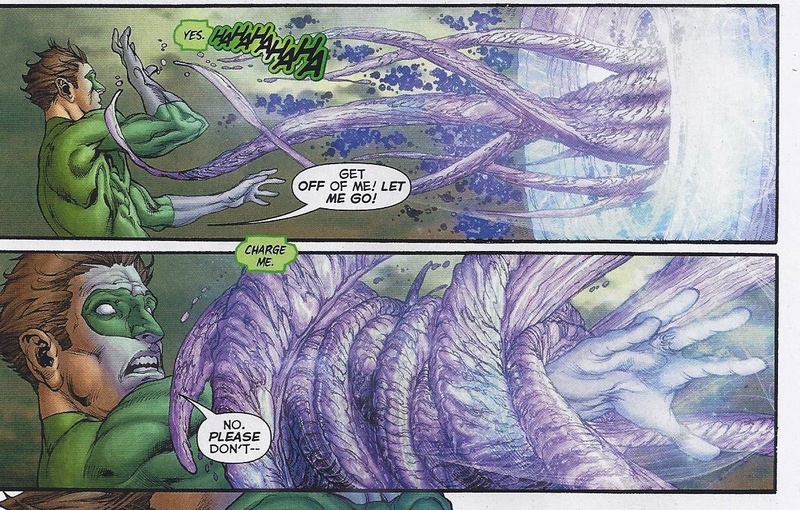 Power Ring’s…power…is literally the opposite of the Green Lantern’s in that his ring saps the emotional energy from him instead of letting him use it. Though he can utilize the ring’s ability to create energy constructs, it comes at the hefty price of Earth 3 Hal Jordan’s physical and mental stability. Johnny Quick and Atomica are two of the most vicious and downright evil members of the Crime Syndicate, doing what they do not out of a sense of duty (like Ultraman) or a desire to create order (like Owlman), but purely for the fun of murdering innocents and living on the edge of sanity. The Crime Syndicate is supposed to be the pinnacle of the concept that Earth 3 is the birthplace of evil, but Johnny and Rhonnie might just be the most evil of the bunch. Seeing various Earth 3 counterparts of defined heroes and villains is also a treat. Captain Cold and Heatwave as cops instead of super villains: awesome. Justice League #26 is a total momentum-killer in a number of ways. At the end of Forever Evil #4, Power Ring’s attack is met by Sinestro, a character we haven’t seen since he went off into deep space after becoming the new host for Parallax at the end of Green Lantern #20. Justice League #26’s cover shows a brutal battle between Power Ring and Sinestro that does not occur. Perhaps it will down the line, but to falsely solicit this issue with that cover is wrong. It’s completely misleading. Cramming the rest of the Crime Syndicate’s origins all into one issue was a bad idea. Justice League #26 not only doesn’t follow up the events of Forever Evil #4, but it also doesn’t bring any relevant information to the table. Forever Evil could have done without the origins of the Syndicate (however interesting they are) and still been a fine event. Instead, this issue is more like an interlude to everything that’s going on and it completely kills any excitement left over from reading Forever Evil #4. This issue is framed by Grid’s narration. Since separating from his human host—Victor Stone—Grid has been unable to “feel” anything, and it seems his only drive to help the Crime Syndicate is to do just that, even if it means tearing the world apart to accomplish his goal. Giving Grid the ability to question its own existence and moral compass weakens the character and the concept Johns is trying to convey. Wanting something is a feeling (desire), yet Johns skirts around this gaping plot hole like it’s nothing. While studying the origin files of the Syndicate, Grid admits he feels nothing when viewing the horrendous things the Syndicate members have done or have had done to them. Though technically, apathy is a lack of emotion, Grid is obviously concerned by said apathy, and concern is an emotion. There are many ways Johns could have written an emotionless Grid without resorting to using actual feelings to present the concept. It feels (pun intended) rushed and shoehorned in as a way to characterize Grid. Justice League #26 is a misleading, bore of an issue. It’s a necessary evil to flesh out the Crime Syndicate, but the presentation and pacing is just totally off.